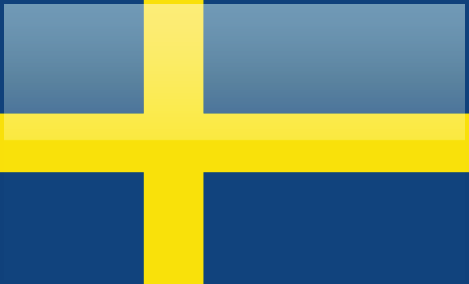 Gambling laws in Sweden and nearby countries is currently in flux, this is largely because the Swedish Government has set up an organization which governs gambling within the country. The problem lies with the European Union, which already does this and does not allow individual countries the same privilege. As it stands now, Swedish residents can gamble at casinos that hold a license issued from within the European Union. However, with the constant changing of laws, 4Flush.com advises that you check with a lawyer if you’re unsure about local laws. Residents from Sweden are still welcome to play at online casinos; however, since we don’t have any Swedish reviews up just yet we STRONGLY advise you to check out CasinosOnline.se for professionally translated reviews and options. There are just four brick and mortar casinos located within Sweden, each actually run by the country’s government. All of the casinos in Sweden check passports at the door, so make sure you have that on hand, and not in your hotel room! There may also be a ‘membership fee’ for entry. The membership is valid for a year, usually ending in December. Some players have reported successfully negotiating their way out of the fee by telling staff that they’re tourists and won’t be in town long enough to enjoy their membership, others say this method failed them miserably. This waterfront Swedish casino is open casino daily from 11:30 to 05:00. The casino is 26,910 square feet, and features 327 slot machines including the 150 that were added to the casinos line up this month. The casino features onsite dining, and entertainment as well. There are four types of games available at this casino, numbers games, card games, like Blackjack and Punto Banco, slot machine games and dice games, like Craps. There are 327 slot machines available at Göteborg Casino which includes internationally recognized titles, as well as games that are traditionally popular in Sweden. The casino added 150 new titles to their slot machine line up In 2012. Among these slot machine games are traditional 3 reel 1 line slots as well as video slots t featuring exciting progressive jackpots. The casino features 42 table games in all, including all of the titles listed below. Casino Goteborg features a poker room with daily tournament offerings, cash poker games, sit n go style events, and major multi-table tournament events. If you’re interested in more information about playing poker in Gothenburg Sweden, check out our poker specific article. The casino features four European Roulette wheels, each featuring a different minimum bet amount ranging from 20 SEK to 1000 SEK. Cosmopol’s Casino located in Sundsvall in Sweden features a 22,000 square foot casino that features 140 slot machine games in addition to 15 table game titles. The casino also features a poker room, and onsite dining establishment. 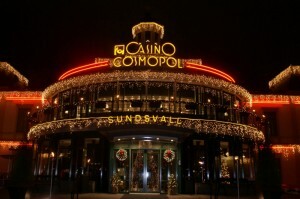 The Sundsvall Sweden casino is open every day from 1pm to 3am. 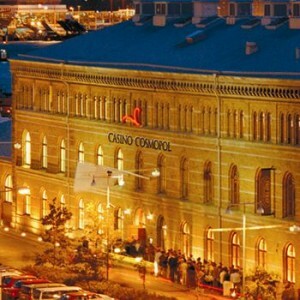 Casino Sundsvall features 148 slot machine games including 8 new slot titles that arrived during 2012. The casino features old fashioned reel type slots, more modern video style slot machines, and slots with progressive jackpots. The casino features a small poker area with 2 poker tables where Holdem Poker and Omaha poker are commonly played. For more information about Poker in Sundsvall Sweden check out our Swedish Poker section. The Malmo Casino in Sweden features 23,000 square foot of gaming including 200 slot machine games, 32 table games, a poker room and onsite dining. The casino is open every day from 1pm-4am. There are about 30 table games available at the casino including all of the games listed below. 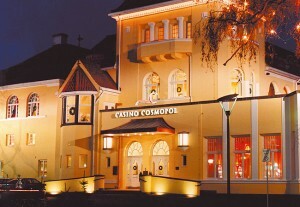 There are 11 poker tables available in the poker room inside Casino Cosmopol at Malmö. The poker room features a full tournament schedule, in addition to cash and sit ‘n’ go type poker games. Both Omaha and Texas Holdem are commonly played at Malmo. For further information on poker games in the area, check out are Swedish poker article. The Cosmopol Casino in Stockholm Sweden consists of more than 350 slot machine games including 150 new titles. The minimum age for entry into the 37,675 square foot Casino Cosmopol in Southern Sweden is 20 years old. ID (usually a passport) is mandatory. The Stockholm Casino Cosmopol also received a new influx of slot machine titles during 2012, adding an additional 150 slots to the casinos line-up. 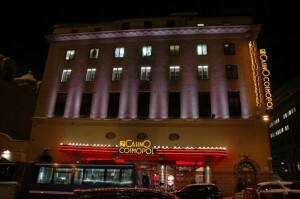 The Casino Cosmopol in Stockholm Sweden features nearly 40 different table games, including those listed here.